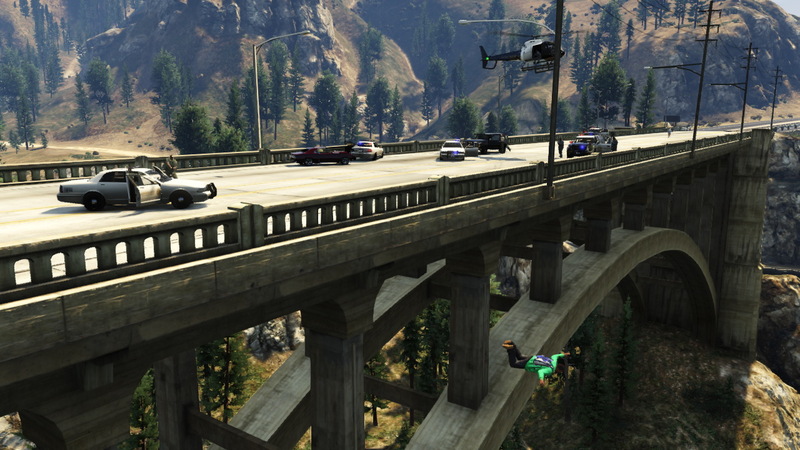 In GTA V, you play as a terrible person. Well, three terrible people really, the game's major gameplay innovation from its predecessors being that you can play as three different protagonists. Driving through Los Santos and the rest of Blaine County - a representation of Los Angeles and the surrounding California countryside - is still the highlight of Grand Theft Auto V, and it does make you feel like you are really part of the criminal underworld of a morally bankrupt city. But it's only worth playing if you are ok with being the bad guy. No, a really bad guy. Now, you may say, that's the hallmark of the crime genre Grand Theft Auto spawned, at least in videogames. 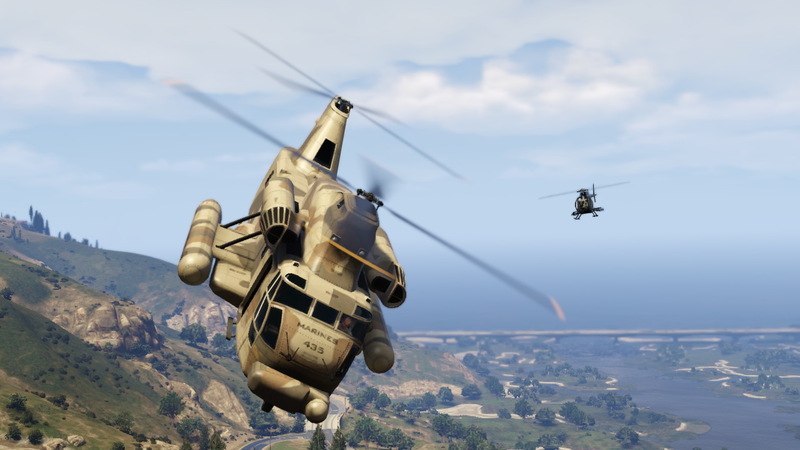 But some of the events and missions of Grand Theft Auto V feel more malicious and, well, evil, than the comparatively light-hearted violence of most games, the recent Saints Row 4 being a perfect example. 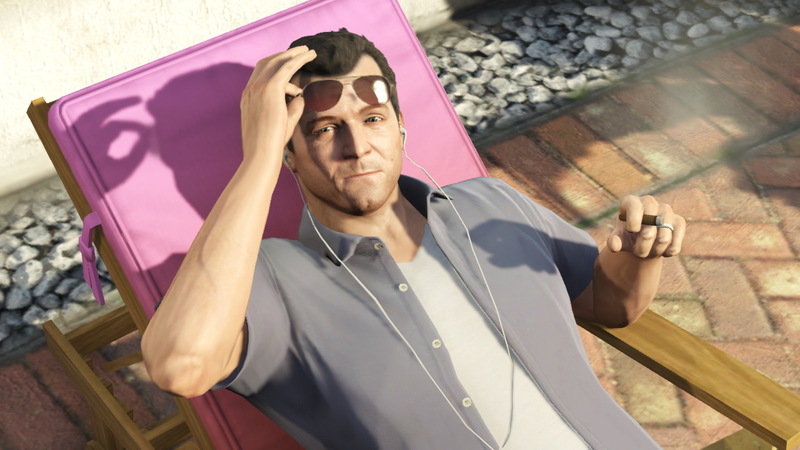 What's missing in GTA V's story is a sense that the characters have been painted into a corner by various machinations beyond their control, like Niko Bellic of GTA IV, or must commit their crimes to mete out justice, as Tommy Vercetti does in Vice City. 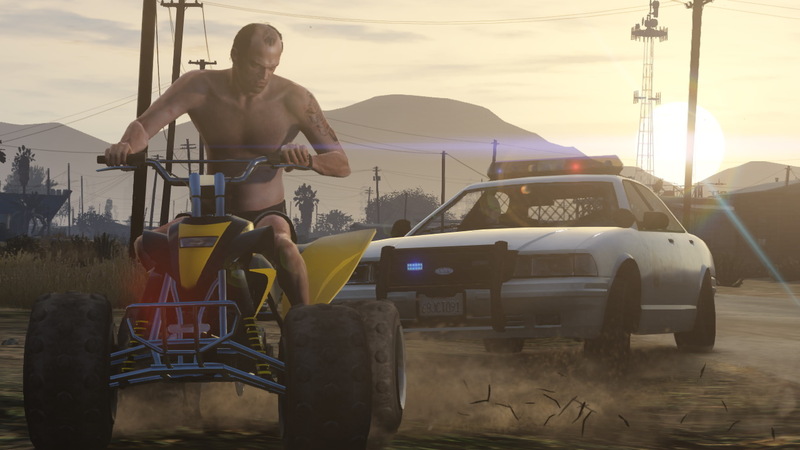 The three main characters of GTAV do terrible things merely to get paid, and deserve no sympathy. There's no drive in them even to be the best at what they do, the last American value we afford criminals, but rather they commit these crimes with no lifeline thrown to the audience to pull us along in supporting them. It is the difference between The Godfather Part 1 and Part 2, between Inglorious Basterds and Triumph of the Will, and between Just Cause 2 and JFK Reloaded. In the former examples, the audience can get behind the anti-heroes depicted for whatever reason and condone their admittedly awful actions, but in the latter group, the subject matter or the protagonist's morals are skewed too far from the norm to be comfortably witnessed. That's what it's like to play Grand Theft Auto V. The three men you take control of throughout the game aren't even anti-heroes. They're just scumbags. That's not to say the protagonists don't end up charming you as you navigate them through their horrible lives. Franklin disrespects everything and everyone in his rundown neighborhood, but somehow forges a bond with a middle-aged white man, Michael, in his search for a way to become more than a crackhead. 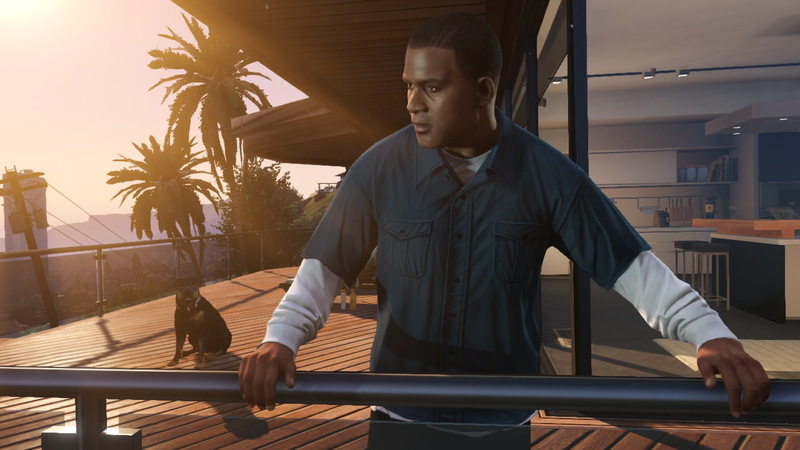 Michael is a retired stick-up man, grown sick of his Vinewood mansion, sniveling teenage kids, and cheating wife. When he mistakenly rips down a Mexican gangster's house - it must be pointed out Michael meant to rip it down, he just didn't know how much it would cost him - Michael enlists Franklin to help him back into the heist game to make money. 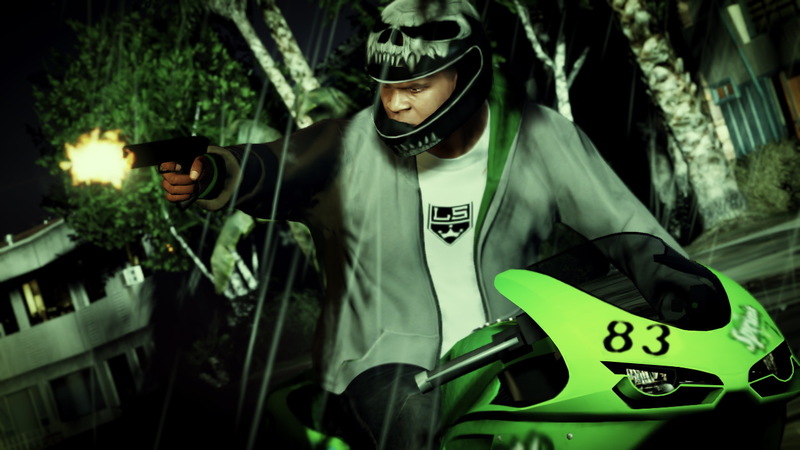 Then there's Trevor, who is busy expanding his meth lab empire in the hills outside Los Santos by stomping bikers in the face. 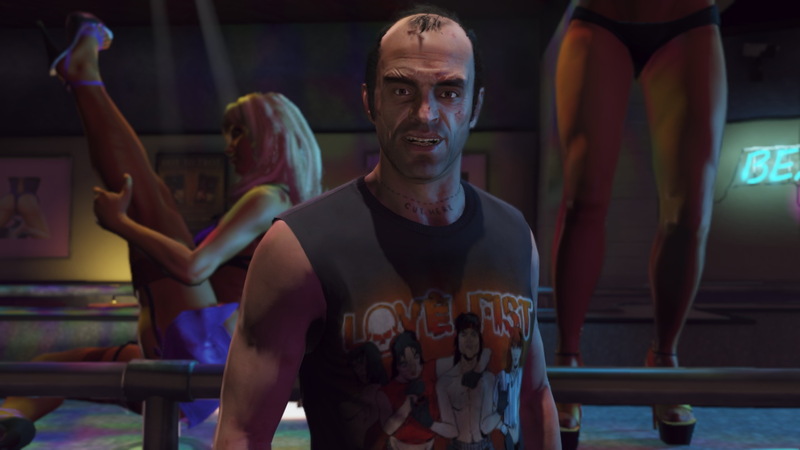 Seriously, Trevor's introductory scene begins with him screwing a scabby woman from behind, and then stomping her boyfriend in the face until he's dead when the cuckolded man has the nerve to confront him. See? Charming! The city of Los Santos is as much a character in GTA V as those guys, and it's just as depressing a representation of humanity. The highways, avenues and streets of the urban landscape are artfully represented, evoking specific neighborhoods and locations in Los Angeles just as Liberty City does for New York. Advertisements and billboards for products like Pisswasser beer and LifeInvader, a parody of Facebook, are supposed to be funny, I suppose, but the radio jingles and faux talk radio spots come off as childish instead. Pedestrians take calls on their cell phones, and overhearing what they say to their lovers, their mothers and their agents creates an aural kaleidoscope of a culture obsessed with self-image and fame, none of it especially pleasant. Satire excels at pointing out our foibles, our faults, but that doesn't mean it makes for great escapism. You'll drive thousands of miles in various vehicles traveling to mission locations, landmarks and shops. 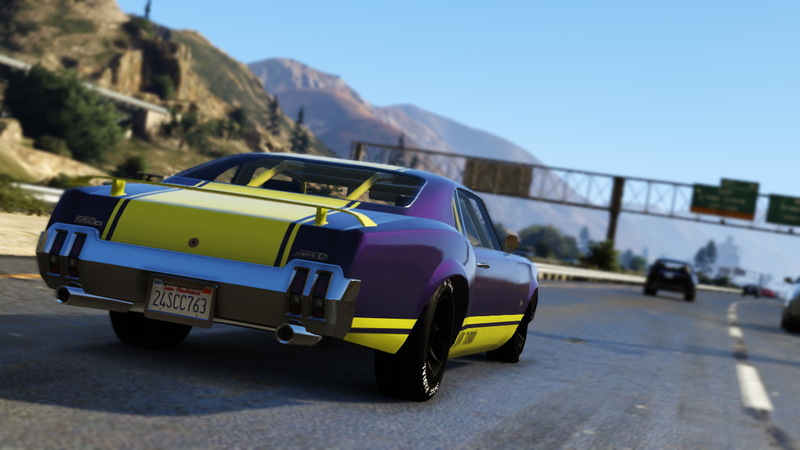 Cueing up your favorite radio station from the 17 available and taking in the scenery is the best part of Grand Theft Auto V. Driving is forgiving, and your inevitable crashes have a low chance of tossing you through the windshield or flipping over your car permanently. Not only can you nab the fastest or best-handling car on the road for a more pleasurable ride, but you also level up each character's driving skill as you play. Franklin starts out as the most expert driver, and he has a special ability that slows down time for a short period to allow you to navigate around corners and between cars. Using the ability to win races and escape cops is very fun, and the RPG-lite mechanics of leveling provide some structure to the experience. 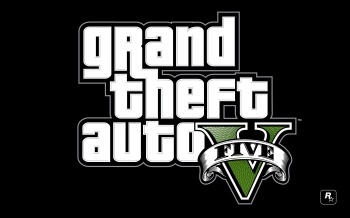 Check out Greg Tito's editorial which goes into depth on the story and characterization of GTA V.